With front of the house decorated I could finally shift my attention to the main event...inside! As I mentioned before, most of what I use has been with me forever. However, this year, aside from the lovely new items given to me by my very thoughtful Mother-in-Law I did add a few new gems to the mix. I decided to work my way from one end of the house to the other, and as always, save the tree for last. First up, I had to prepare the adorable advent calendar my MIL gave me last year. Within each knitted, numbered stocking I placed two Hershey kiss Santa hats for my two big boys. Once they were stuffed, they were ready to be hung. I decided to "shwag" them in the kitchen nook so the boys could delight in eating their special treat each night after dinner. Atop the frames they went covering the entire wall. I made sure to have the stockings avoid the beautiful hand print wreath and Rudolph art the boys had made as it was absolutely part of our holiday decor. Since I am at Costco about twice a week, it was inevitable that I would buy some Christmas goods while shopping...despite my best efforts to avoid that area. I saw these large ornaments and HAD to have them...you know how much I love me some ginormous ornaments! I hung them from the ceiling using red and silver sparkle ribbon in front of each window. It was PERFECT! With a quick rearrange of my apron collection (pulling the appropriate colors forward) and a vintage towel on the oven...the kitchen area was done! Now it was time to attack the dining room. I grabbed a glass cake display and filled it with mini ornaments. I laid down some vintage cloths my Thriving Mommy had snagged for me and was in love with my star studded shimmery showcase. As I said before when decorating for Fall, make fabric your friend. Jo-Ann's has amazing coupons and a small investment up front can change your home from "Boo" to "Whoo Hoo" in the snap of a manicured hand. I use my different fabrics for all holiday decorating and couldn't be more thankful I have it! I "shwagged" my vintage bar with red glitter fabric, threw on a few plastic (I swapped out all my glass ones for plastic this year after breaking more than I would like around little feet) ornaments and was done in less than 10 seconds! I decided this area would also be where I hung my favorite DIY clothespins to share all the greeting cards we receive from loved ones. I moved around the room draping fabric and tossing out ornaments. I spread my wave of Christmas cheer over every surface I could find. As I approached the living room, I grabbed my freshly washed Christmas "blankie" and draped it over the couch next to our fancy pillows. You know we need a good cuddle blankie to watch Christmas movies! I used an old gift box to load with Christmas books the boys and I could read together while snuggling in said blankie. At the base of the fireplace it was nestled and ready to be used throughout the day. More fabric went on the mantle and all my favorite breakable items were placed high and well out of reach of little hands. Up went the mercury glass trees, candles and even our new candy light (bought at about 90% off at the end of the season last year). And of course, don't forget our hanging, handmade stockings...thanks TM! In our entry way I added yet more fabric (I know, does it ever run out?! No, I strategically plan for all spaces), ornaments and snow globes. With one last piece of furniture to decorate it was time to take on the tree. I placed another gorgeous advent calendar (this one a tree) atop...wait for it...more red fabric and threw on some ornaments for good measure. Then it was tree time! The boys helped me put it together, (we have a fake one as I can't bear to cut down a perfectly good tree each year) and then we called in Daddy to help us add the ornaments. With the hot chocolate flowing and the Christmas music blaring I watched my little men have the best time dancing and helping. However, soon they were found hoarding the mass amount of train and car ornaments we have rather than placing them on the tree...typical. No tree would be complete without mommy having one ornament to call her own...Ariel...DUH! 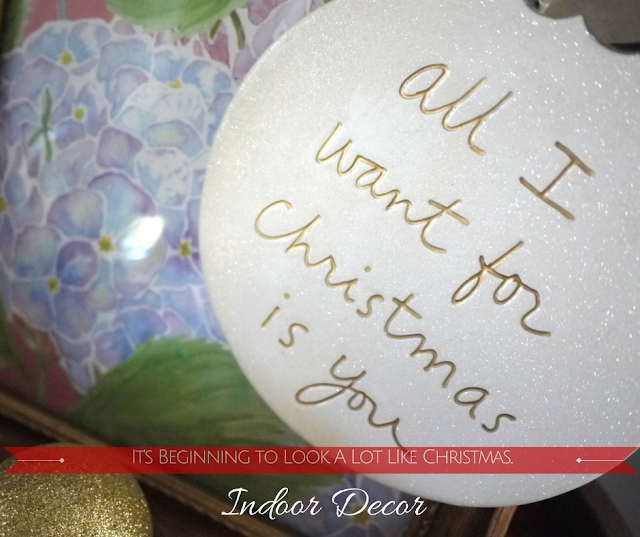 What are your favorite indoor decorations?